There are many different reasons why parents consider preschool programs for their child. More and more, both parents work outside of the home and must find appropriate childcare options. Then there are parents who have the option to stay at home with their child, or those who have a nanny, but still wonder if their child is missing out by not attending a daycare or preschool program at all. Whether you need a safe place for your child while at work, or you are considering a preschool program for other reasons, it’s important to know what the benefits of preschool can be for your child. Is preschool important for all children? Most experts agree that there are many benefits for a child that attends a high-quality preschool. Preschool can be an essential stepping stone on your child’s unique path to social, physical and cognitive development. Many studies, including reports from the National Institute for Early Education Research, suggest that all students benefit from preschool programs. Important social and cognitive improvements were seen in an array of students who attended preschool before entering kindergarten. Other than learning letters and numbers, how can attending preschool help my child? A high-quality preschool program such as Carpe Diem Private Preschools is designed to set up young children for future academic, emotional, and social success. Academic benefits aside, many child development experts believe preschool is an important step in helping your child learn how to be a more successful student — how to listen well, how to raise your hand and patiently wait for your turn, how to participate in group activities. These are all skills that can help tremendously in your child’s transition into kindergarten. Perhaps more importantly, children learn how to socialize – getting along with other children, sharing, and working together toward common goals. Preschool experiences can help them learn how to manage frustration or anger. They begin to understand how to work out their own problems with peers. Preschool is also an important time to help children develop their motor skills. High-quality preschool programs provide fun opportunities for children to run, climb, and play active games. Activities like cutting with safety scissors or threading beads help children develop fine motor skills, strengthening hand-eye coordination and balance. From academic to emotional to social development, a successful preschool experience can help your child build a well-rounded, solid foundation. Can’t I help my child prepare for school without attending preschool? Parents can make a tremendous impact on their children’s emotional and intellectual development. However, a child who is with a nanny rather than enrolled in preschool for example may not have the same opportunity to develop ‘school readiness skills.’ These include following directions and working independently. Preschool is often a child’s first experience in a structured setting with teachers and groups of children. It’s an opportunity to learn to share and begin the foundation for learning that will occur in elementary school. To reach their full learning potential, children need to feel cared for and secure with a teacher or caregiver. Preschool gives young children the opportunity to spend time away from parents and build trusting relationships with teachers and other children. This gentle, gradual introduction to a school setting can help ease separation anxiety and the transition to kindergarten for you and your child. Will preschool cut into important play time and push my child to grow up too fast? Your child’s first years of school should be filled with wonder and excitement. It’s a time of incredible emotional, social, physical, and intellectual development. The basic math and literacy skills learned at this stage, such as letter sounds and counting, will help build a strong foundation for a lifetime of learning. However, parents should not have to choose between protecting play time and making sure their child is ready for kindergarten. Study after study have proven that young children learn best through play and creative activities. A high-quality preschool program like Carpe Diem Private Preschools understands this, and will offer preschoolers an effective balance of both. To nurture a child’s excitement and motivation for learning, these programs introduce early literacy and math skills through activities that are engaging and meaningful to children. Learning songs or engaging children in a discussion about an exciting story read aloud builds listening, comprehension, and language skills. Sorting or counting games build children’s understanding of numbers, categories and sequence, which supports later math learning. The staff at high-quality preschools and child care programs understand how young children develop and learn, organizing space, time and activities that inspire and strengthen children’s social, emotional, cognitive, and physical abilities. Will preschool help my child transition to kindergarten and beyond? Developing social skills is important before starting kindergarten. Preschoolers learn how to share and cooperate, to work together and take turns, to participate in group activities and follow simple directions, and to communicate wants and needs to others. In addition to strengthening socialization skills – how to compromise, be respectful of others, and solve problems – preschool provides a place where your child can gain a sense of self, explore, play with her peers, and build confidence. Children’s sense of self-worth will grow as they learn to take care of themselves and help others. Preschool teachers can and should appeal to a young child’s desire to engage in “real work” by offering him chances to help in the classroom, such as passing out materials, setting the table at snack time, or feeding the classroom pet. Children learn to follow classroom rules. They may be expected to wash their hands before snack time, keep personal belongings in their “cubby,” and put away toys before moving to the next activity. From a very young age, a quality preschool experience can instill a sense of responsibility, accountability, and self-motivation that a child will carry with them wherever they go. Every family and child is unique. 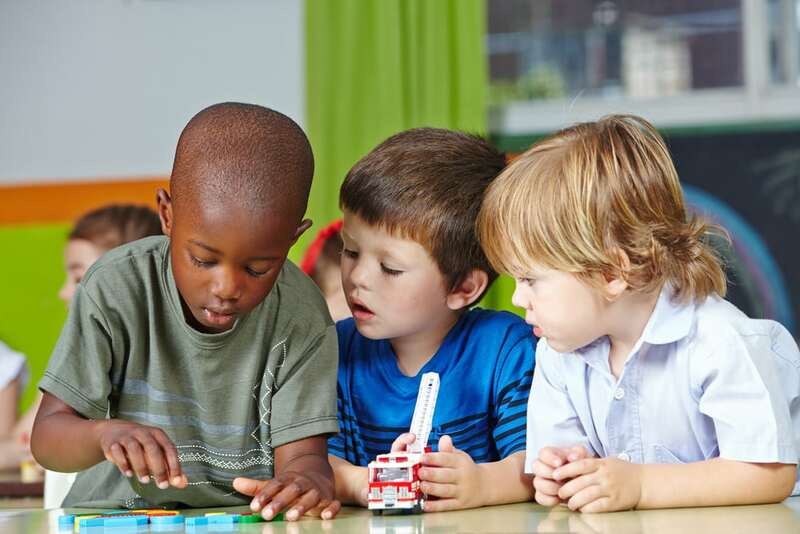 Some parents enroll their children in preschool hoping for educational benefits, while others enroll their children in preschool mainly for social interaction with other kids. Whatever your reasons, enrolling your child in a high-quality preschool program such as Carpe Diem Private Preschools helps set your child up for success in kindergarten and beyond.